Joan and Matt had met a few times before, yet it wasn't until Joan's best friend's wedding (the bride was Matt's cousin) that they developed a true connection. The night of the rehearsal dinner, Joan spoke again with the sweet, funny, smart, considerate man who was driving her and the bridesmaids to the dinner. She realized she was in the presence of someone extraordinary, and they spent a good deal of that night talking, dancing, and getting to know each other. They said goodbye that evening without exchanging any contact information, but became friends on Facebook three days later. A few weeks after becoming a couple, Joan quit her job in North Dakota, found two roommates in the Twin Cities in Minnesota, and moved there to pursue a new job and live closer to Matt. Three and a half months after they'd started dating, Joan was back home in North Dakota, getting a manicure with a friend. Matt was supposedly in Minnesota with family for Thanksgiving, yet by the time Joan's nails were done, her phone rang and there was Matt, holding a flower, a ring box, and some tissues. As he walked toward his future bride, Joan shouted a joyful "Yes!" 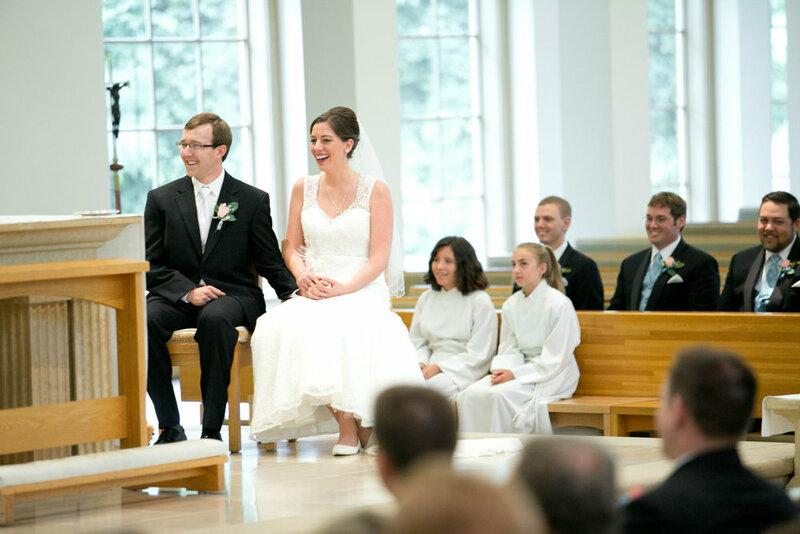 From the Bride: Matt and I decided to get married in the parish that had become "ours" in the Twin Cities, where we'd made such a strong connection with our community and priest, instead of my home parish back home in North Dakota. 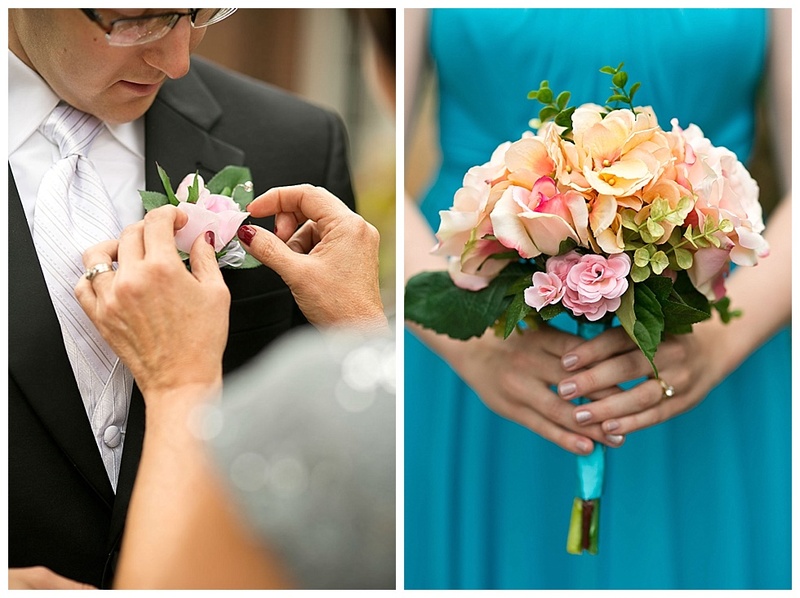 We'd hoped for a summer wedding, and chose a day in July. I purchased my dress with my best friend, and I honestly didn't care for it on the rack, but once I put it on and learned that the style shared a name with one of my closest cousins, I said loved it immediately. 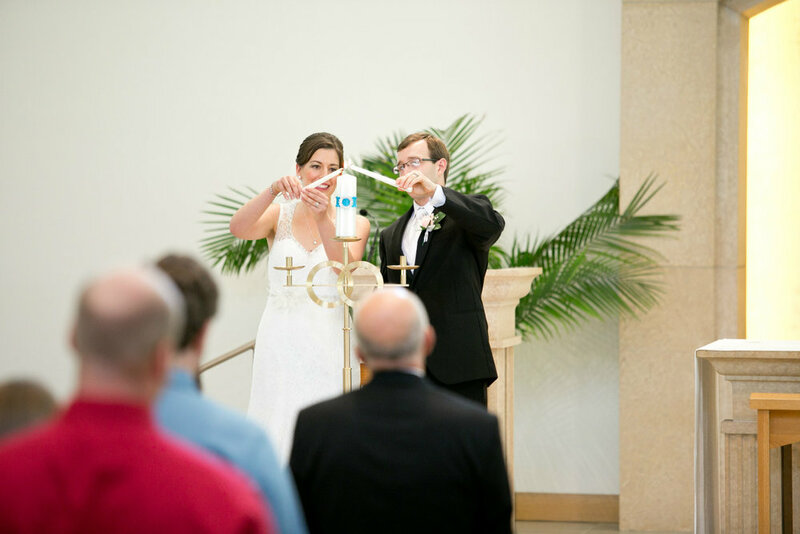 One of our favorite parts of wedding planning was choosing the readings and songs for the liturgy. We spent a lot of time listening to favorite songs and reading Scripture until we finally decided on the readings we wanted shared on our day. I also have always dreamed of writing a song for my wedding someday, so I was honored and excited to compose the psalm sung during the Mass, to the verse of psalm 37's "Find your delight in the Lord, and he will give you your heart's desire." When I heard the song being rehearsed before the Mass, I broke down crying because it was just so moving hearing the words I'd prayed so many times come true for me that day. 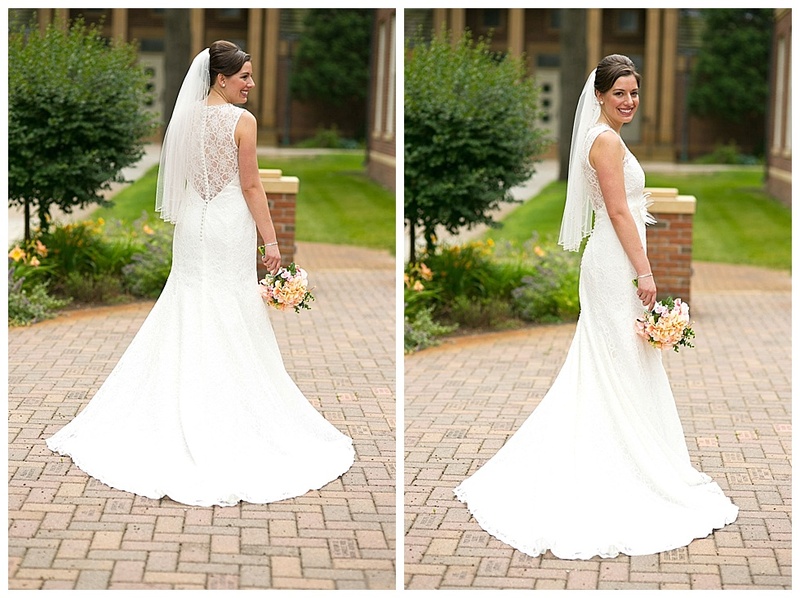 Matt and I had gone back and forth on doing a first look, and I'm so happy we did; it gave us the opportunity to spend more time with each other that day. It also allowed us to take pictures with our wedding party and family before the Mass, so we could arrive at our reception shortly after our guests did. We wanted to spend as much time with our family and friends as possible since many of them traveled so far to be with us! Refrain: Find your delight in the Lord, He will give you your heart's desire. Verse 1: Trust in the Lord and do good that you may dwell in the land and live. Commit your way to the Lord. Trust in Him and He will act. Verse 2: Wait eagerly for the Lord and keep His way. He will raise you up, and you will inherit the land. Verse 3: The salvation of the righteous is from the Lord. The Lord helps them because they take refuge in Him.